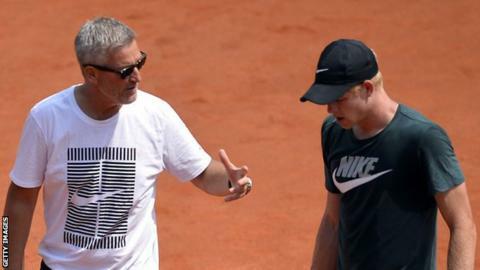 British number one Kyle Edmund said he was "sad to announce" that his coach Fredrik Rosengren is retiring. The Swede became the 24-year-old's coach towards the end of 2017. "You've been an integral part of the team over the last year and a half," said Edmund, who reached the Australian Open semi-finals in 2018. "Together we've reached a top 15 ranking, Grand Slam semi-final and won a title in Antwerp in October. I will be forever grateful, enjoy retirement." Edmund, who was born in Johannesburg and grew up in Yorkshire, was beaten in straight sets by Tomas Berdych in the first round of this year's Australian Open. He has not played since because of a knee injury and he is currently ranked number 28 in the world.